1. High reliability by S.M.T. & TQC. (surface mounting technology). 2. High lsolation over than 50M / 500VDC. 4. Low enable current less than 7.5mA / 12VDC C MOSIC or TTL Compatible. 5. Low EMI / EFI & surge by zero cross trigger method. 6. 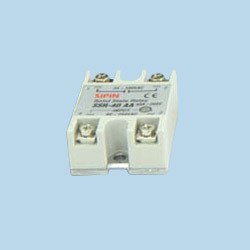 High surge current duration over 10 Times of rated current / one cycle. 7. High surge voltage duration by snubber circuit. 1. Rated load current: 75A. 2. Input voltage: 3~32VCD. 3. Operating Voltage: 24~380VAC.